I took the opportunity to not be on my feet and to see if I could get myself rested up to start another long week. I didn’t go anywhere. I didn’t do much of anything. I did watch some daytime television. Something I simply have not done in a year. It was refreshing. And the sun finally did come out today! After days of horrible weather, that big yellow ball in the sky made a beautiful appearance. Just like Annie sang, there’s always tomorrow. Rather than write a detailed post tonight I am going to attempt to rid myself of the monster headache that’s plaguing me before my head falls off my shoulders. 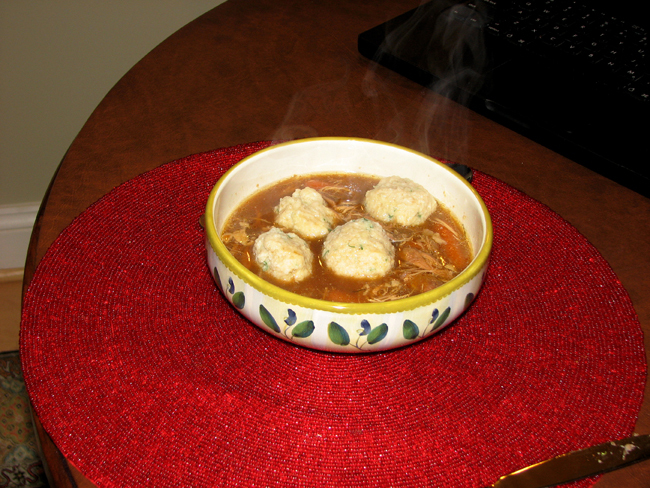 But first, below are a couple of photos of the DEElicious matzoh ball soup that was part of tonight’s dinner. It was the best part of my day. Just what the doctor ordered. It’s “Kosher penicillin,” and it works! 🙂 This soup always has incredible healing powers. I’d like to bottle it for the world to cure what’s ailing it. 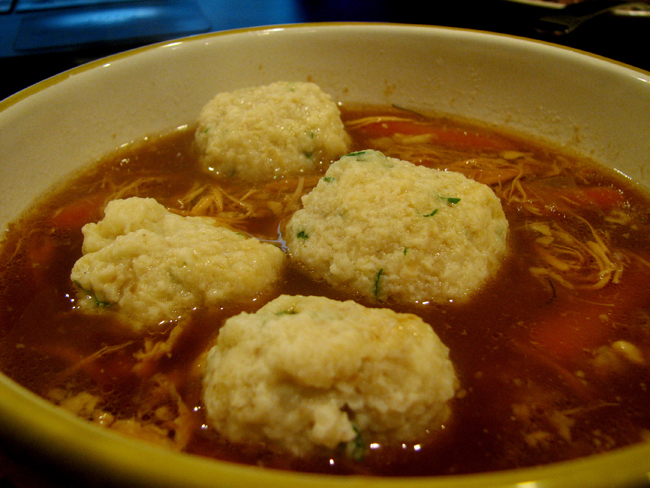 Those were not meatballs, they were Matzoh balls that usually go into Kosher chicken soup like they were shown here. If they are too big, they are too difficult to handle in the hot soup, but I could have made them just a bit bigger. Mmmmm. I love matzoh ball soup! Have had like 10 bowls in the past couple days. looks delicious!